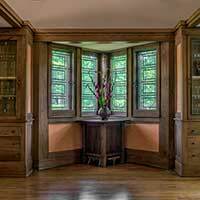 The annual Wright Plus Housewalk features rare interior tours of private homes and public buildings designed by Frank Lloyd Wright and his contemporaries in Oak Park, Illinois. Tour spectacular mansions and landmarks, and enjoy a festive day. 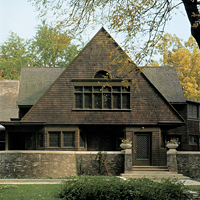 The Frank Lloyd Wright Home and Studio (1889/1898) served as Wright's private residence and workplace from 1889 to 1909—the first 20 years of his career. Wright used his home as an architectural laboratory, experimenting with design concepts that contain the seeds of his architectural philosophy. 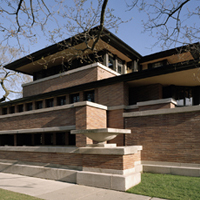 The Robie House on the University of Chicago campus is considered one of the most important buildings in the history of American architecture. 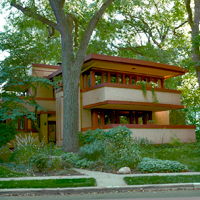 It was created by Frank Lloyd Wright for his client Frederick C. Robie, a forward-thinking businessman. 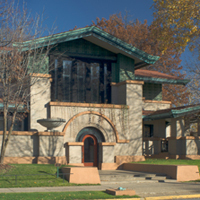 Designed in Wright's Oak Park studio in 1908 and completed in 1910, the building is both a masterpiece of the Prairie style and renowned as a forerunner of modernism in architecture. 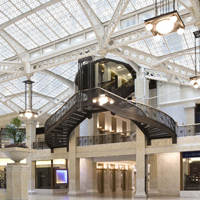 Set in the heart of Chicago’s financial district, at 209 South LaSalle Street, Daniel Burnham and John Root’s Rookery Building is a Chicago landmark, containing a luminous and brilliantly articulated central light court remodeling by Frank Lloyd Wright. The richly conceived yet intimately scaled Bach House (1915) adopts the vocabulary of the Prairie house, but looks toward future stylistic directions in Wright’s work. Described as “semi-cubist,” its compact plan is a modification of Wright’s “fireproof house,” which was published in 1907 in Ladies Home Journal. In 2013 the building was meticulously restored to its original appearance. 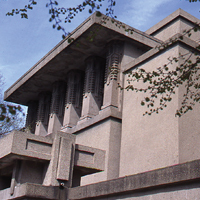 Unity Temple is a short walk from Wright's Studio where it was designed. It is the only surviving public building from Wright's Prairie period and one of his most significant accomplishments. Chicago is where the legendary architect Frank Lloyd Wright spent the first 20 years of his career. 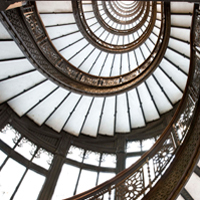 Leave the driving to us as you experience the best of Frank Lloyd Wright’s Chicago with expert commentary about the life and work of the man who established a uniquely American style of architecture, and interior tours of his famous sites. 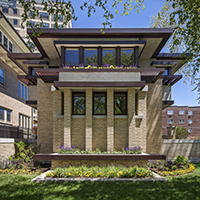 Oak Park is home to the world’s largest collection of buildings designed by Frank Lloyd Wright. 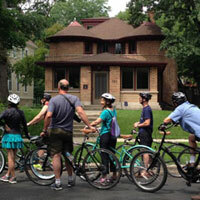 Explore its picturesque historic neighborhoods on a guided bicycle tour of 22 Wright-designed structures. Make the most of your time in Oak Park and enjoy a complete Wright experience. Choose one of our Oak Park Combination Tours. 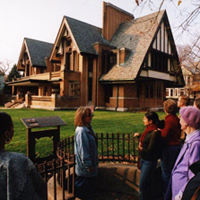 This in-depth tour showcases the very best of Wright in Oak Park in the company of an expert guide. Enjoy visits to the Home and Studio, through the Frank Lloyd Wright Historic District, and Unity Temple. Gain exclusive access to Frank Lloyd Wright’s most celebrated landmarks in Illinois and Wisconsin. Our expert guides provide custom content and in-depth analysis—plus, we do all the driving. The Frank Lloyd Wright Trust welcomes all guests. We recognize the diverse needs of our audience and offer accessible programming to enable guests to explore the powerful aesthetic experiences of authentic Wright sites, preserved to Wright’s original design vision.